The Adventures: Who Kidnapped The Koala? The Adventures:Who Stole The Cahaba Lily? The Case of The Missing Plovers: When the Sizzling Six host a group of lively teens from the Chickcharney Eco Club, they plunge into to another exciting adventure—this time on remote island cays in the Bahamas. During the visit, an unusual friendship develops between Sophie Price from Alabama, and Abbie Roller from the Bahamas. Their friendship uncovers a clue to a mystery that's puzzled scientist for years. The clue is hidden in a picture of a tiny, endangered shorebirds. Their discovery sets off an incredible chain of events, and a race against time. Can the Sizzling Six, their Bahamian friends, and an ace team of scientists rescue the birds and their beautiful island habitat from destruction? Who doesn't love a mystery—especially one based on a true discovery! I loved getting to know these young citizen scientists who, although fictional, are undoubtedly typical of many environmentally aware students of today. On so many levels, the reader is drawn into the adventure in such a skillful way that readers become engrossed in the plot and the characters while on the way to a substantial learning experience. A delightfully readable adventure. Sharon Bounds, PhD Early Childhood Education. Reading Specialist. I like how Claire Datnow has taken the reader from Alabama to the Bahamas and back, and I think it's neat she has incorporated email and text messaging into the flow of the story. The dialogue flows nicely and it's easy to recognize the different personalities of each character. I like that the author has incorporated actual environmental issues into the plot. I like that author has incorporated different threads into the plot: the kids' interpersonal relationships, the search for the Piping plover hot spot, the local bird conservation work, the fight to save the birds’ habitat, and the travel between locations, which all flows so well! The Sizzling Six are back in action in this new eco mystery, this time traveling all the way to the Bahamas in hopes of discovering the wintering place of the endangered Piping plover. Claire Datnow has done an excellent job of making this book seem real, with the addition of lots of Bahamian cultural flavor and interesting characters. 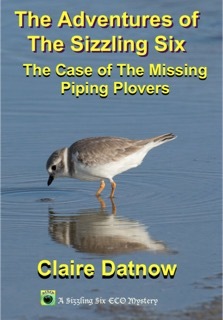 The latest in the "sizzling six" series of books has the middle school student environmental heroes from the "Eco Brains Club" travelling from their home base in Alabama to the islands of Bahamas where they hook up with local students and scientists to solve a mystery about piping plovers, a tiny endangered shorebird. I don't want to give the plot or "mystery" away, but as a piping plover biologist myself who has worked in the Bahamas, I can say the book gets the science facts right and captures the local color and feel of the Bahamas (and coastal Alabama). The story is fun and lively, made all the better that there is a strong conservation message, not only about piping plovers but for a number of coastal and marine issues. A good read for pleasure, especially for young teens, but this could also make a selection for teachers to try to introduce conservation and ecology lessons in classroom. Looking forward to seeing how she weaves her message and story into some of her other books that feature different at-risk species I love, such as the monarch butterfly.